Whenever I go visit my friends up in the Los Cerritos neighborhood north of Mazatlán, I take a bus as far north as the El Cid resort, then duck behind the resort to a dock that takes me to a water taxi.The ferry shuttles between the Marina of El Cid and a little slice of beach where hotel guests go. From there, I can walk up to the house where I used to live. Even Mexican friends who have lived in Mazatlán their whole lives didn't know about the shuttle and I loved telling them about the little unknown beach on the other side. Just a slice of sand with maybe 40 beach loungers, it is open to the public. You can go there and be served piña coladas and shrimp cocktails under a palapa (a Mexican thatched umbrella) along with the hotel guests. Few children make their way there so it's very tranquil. Day after day, Felipe, the ferry's captain, would see me waiting under a palapa from the El Cid side and come to retrieve me. Already sweating through my gym clothes by eight in the morning, he piloted the boat in a crisply starched shirt, cool under his sailor’s cap. “Buenas tardes,” he'd say quietly when I boarded the ferry, with utmost decorum. Then he would nod and smile shyly, sometimes taking my hand to help me off the boat when it arrived at the El Cid side. When the tropical heat drove guests away from even a beach, we were often alone on the ferry as I went back and forth to the gym in the mornings. Months passed. Now and then we'd break the silence and he would describe the birds or the jumping fish. I taught him the English word “gorgeous," chosen because Spanish has a dozen words for "pretty" which I've always found useful. As months went by the days remained warm but shortened, which felt strange as accustomed as I am to associating warm days with long ones. When the November arrived, I found myself waiting under the palapa in the dark at only 6:00 pm. Yet Felipe somehow always saw me waiting there from the other side. Very soon I would see his ferry move gently across the inlet for me. Once on board, the night lights of the Marina twinkled gaily on the right as the ferry moved just fast enough to generate a welcome breeze over the water. We would hear rather than see the fish jump. We didn't talk much. But when no one was watching, Felipe would let me drive the boat. Most recent: Skype practice is a must if you're serious about your Spanish in the U.S. My Language Exchange has more older students, plus asks your permission each month before they bill you. Kerry Baker is a partner at Ventanas Mexico, providing resources to those exploring living full-time or part-time in Mexico. 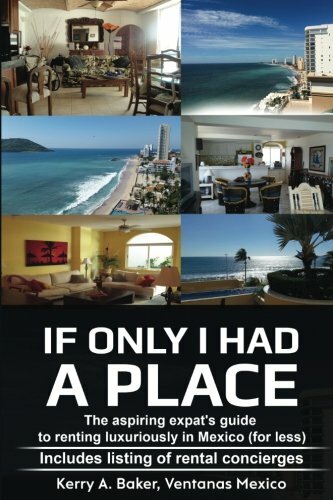 Recently I released "If Only I Had a Place," a guide to renting an awesome place in Mexico for less. She also wrote the "Interactive Guide to Learning Spanish Free Online" - an interactive tool for potential expats. Yes, you can learn Spanish post-50. I did and here are the free tools I used, organized into lesson plans.